Located in South Texas, San Antonio is a cultural gateway into the American Southwest. It is the seventh largest city in the United States and the second largest in Texas with approximately two million people in the metropolitan area. 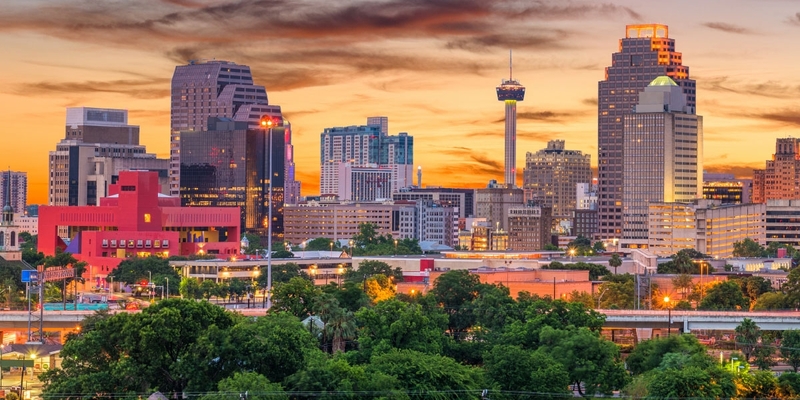 Despite being one of the fastest growing cities in the nation, San Antonio has managed to maintain its charm, cultural beauty, and independent spirit. With a variety of tourist attractions, tasty cuisine, and mild weather, it is no wonder that San Antonio is the most visited city in Texas. Famous for our River Walk, the Alamo, Tejano culture, and home to Sea World San Antonio and Six Flags Fiesta Texas theme parks, the city is visited by 26 million tourists per year according to the San Antonio Convention and Visitors Bureau. San Antonio is also home to our five time NBA champions, the San Antonio Spurs!! The first museum of modern art in Texas – the McNay Art Museum, the Botanical Gardens, Brackenridge Park, the San Antonio Zoo, and the Japanese Tea Gardens are other favorite attractions. San Antonio has a diversified and resilient economy with four primary focuses: financial services, health care, national defense, and tourism. The city has a strong military presence – home to Fort Sam Houston, Lackland Air Force Base, Randolph Air Force Base, and Brooks City-Base. It is also home to the South Texas Medical Center, the largest medical research and care provider in the South Texas region which is made up of a conglomerate of major hospitals, clinics, research and higher educational institutions. It is the center for a $14 billion biomedical industry. The jewel of the city is the River Walk, which meanders through the downtown area. Lined with numerous shops, bars, and restaurants, this attraction is transformed into an impressive festival of lights during the Christmas and New Year holiday period. The downtown area also features the Cathedral of San Fernando (the oldest cathedral in the United States), the Majestic Theater, HemisFair Park (home of the Tower of the Americas and the Institute of Texan Cultures), La Villita, the Spanish Governor’s Palace, and the historic Menger Hotel. North Star Mall, El Mercado, and the Shops at La Cantera provide a diversity of stores and opportunities for San Antonio shoppers.